The day is yours to relax and explore the city on your own. See the grandeur of Germany with a scenic river cruise through its most picturesque destinations along the Main and Rhine Rivers. Your European scenic river cruise begins with two nights in Munich. You’ll enjoy a guided tour of King Ludwig’s Neuschwanstein Castle, and visit the mountain village of Oberammergau—known for its once-a-decade production of the Passion Play. You may decide instead to take a guided tour of the fascinating highlights of Munich. You’ll then embark on your Avalon Suite Ship® in Nuremberg, and sail to Bamberg for a guided walking tour of the historic home to imperial dynasties. Your enchanting river cruise continues to Würzburg—the “Pearl of the Romantic Road.” From here sail to Frankfurt, where you can join a guided sightseeing tour of the city, or visit the nearby town of Seligenstadt. On your way to Rüdesheim enjoy a sailing through the picturesque Wachau Valley. Then cruise to Strasbourg and join a guided city tour of Strasbourg’s sights, such as the stunning stained-glass of its gothic cathedral, the astronomical clock, and La Petite France district. Your scenic cruise through Europe includes a stop in Breisach to visit Germany’s beautiful Black Forest region. Choose a guided tour of charming Colmar, or join a day trip to the Black Forest’s Vogtsbauernhof open-air museum, and more. 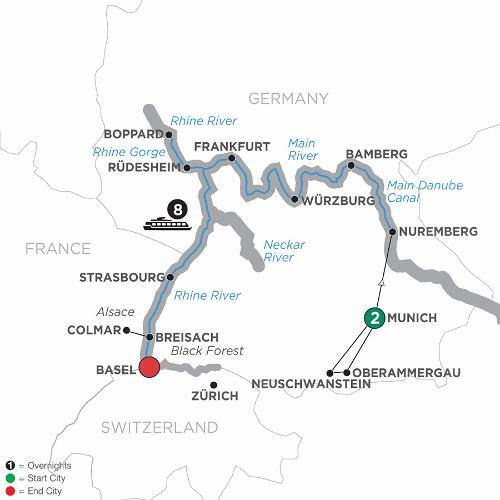 Your river cruise on the Rhine and Main Rivers comes to an end in Basel, Switzerland, but your memories of this tremendous adventure through many of Europe’s most beautiful destinations will last a lifetime.